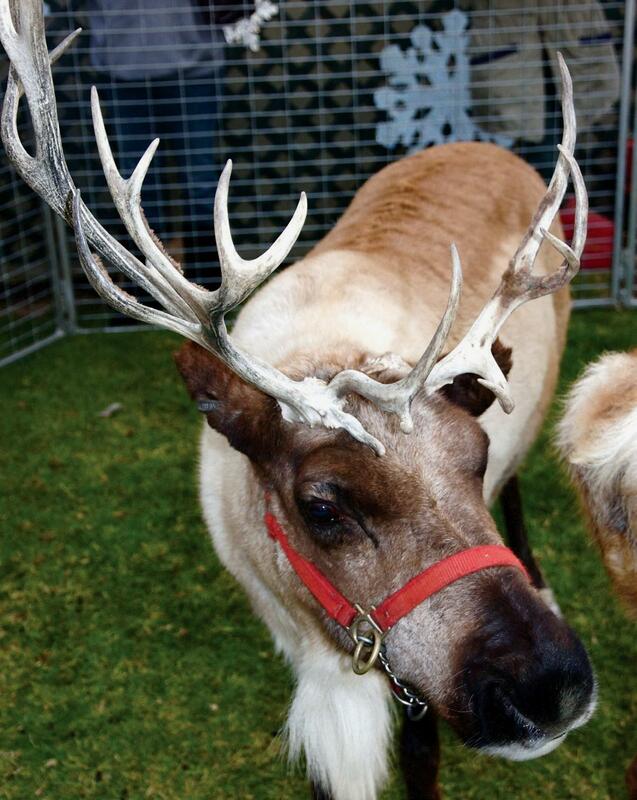 IS IT RUDOLPH?—A reindeer at last year’s Winter Wonderful is posed for petting. Youngsters can see live reindeer as well as Santa and Mrs. Claus at the annual holiday event at Ventura Harbor Village. Ventura Harbor Village will host the 36th annual Ventura Harbor Boat Parade of Lights and Fireworks at 7 p.m. Fri. and Sat., Dec. 14 and 15. The Winter Wonderland and Holiday Marketplace will run from 1 to 5 p.m. Sat., Dec. 15. The two-day celebration features a Parade of Lights Carnival on the Ventura Harbor Village Main Lawn, visits by Santa and Mrs. Claus at the Carousel Stage and harbor-front dining. A fireworks display will follow the parade each evening. On Saturday evening, Santa and his sleigh will cross the sky. The Winter Wonderland and Holiday Marketplace will have free visits with Santa and Mrs. Claus and live baby reindeer (bring own camera for photos), Victorian carolers, toy soldier band, faux snowfall, craft stations, holiday characters and boutique shopping. At the Parade of Lights, attendees can stop by the Ventura Harbor Village booth near Coastal Cone Ice Cream for a pair of 3-D glasses to watch the fireworks display. To view the lights from the water during the boat parade, public cruises will be offered by Island Packers (for reservations, call (805) 642-1393) and Ventura Boat Rentals (for reservations, call (805) 642-7753). Admission to the Parade of Lights and the Winter Wonderland is free. Parking is free in Ventura Harbor Village and along Spinnaker Drive. Arrive early for best parking. Boater applications for the parade are available by calling (805) 477-0470. There is no charge to enter a decorated watercraft. Entry includes an 8-by-10-inch keepsake photo, awards, prizes and Boaters Brunch at The Greek at the Harbor restaurant. The public can vote for the People’s Choice Award favorite on Facebook. View parade entries on the 2012 People’s Choice Award album posted Dec. 15 and “like” to vote. For more information, visit www.VenturaHarborVillage.com or call (805) 477-0470.